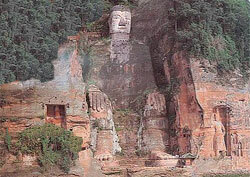 The Leshan Great Buddha is the tallest carved statue in the world. It was sculpted out of a hillside more than 1200 years ago. The seated statue's measurements are staggering. The Leshan Great Buddha is 71 meters (234 feet) high. The head is as high as a five story building. The middle fingers (see photo) are nearly five times taller than the average person. You can view the Leshan Great Buddha from the deck of a tourist boat or by climbing up and down the steep stairs that flank the statue. The boat provides a perspective view, the stairway gives you an up close look at the statue's features. If you have time, do both. Avoid the typical long waiting lines for the stairs by being one of the first or last people of the day to visit the Leshan Great Buddha. The statue was carved over a 90-year period overlapping the 8th and 9th centuries.